Serving Seattle, Auburn, Tacoma, Puyallup, Port Townsend and surrounding communities in northwest Washington State. aircraft condominium hangars at an affordable price. hangar makes more sense than ever. increased in value on the average or up to 10% per year. All of our hangars are equipped with electric Bi-fold doors with walk through man doors. No more tugging or pulling on those old sliding doors. With Bi-fold doors, your opened door will not intrude on your neighbor's hangar. Our ceilings and exterior walls are insulated with vapor barrier insulation to prevent condensation. Our concrete slabs also have vapor barriers. Not only does it make good sense to buy a hangar for your own use, it could be a very good investment for rental property. 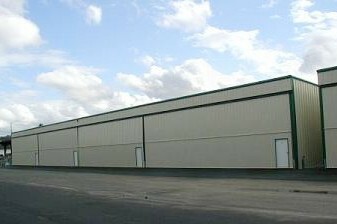 We will also build you a private hangar on your own land or supply you with a building package. Contact John (206) 713-7433 for more information. Just a note for the novice and light hearted, it's hangar, or hangars not hanger, or hangers.